As a rare drinker the closest I’ve had to the Campari red is probably a squirt of a strawberry-fragrance dishwash liquid that landed on my lip while trying to drown a mosquito on the windowsill. Milla Jovovich was the obvious bait for me on this quick trip to Milan, as I joined Campari celebrate their Campari 2012 Calendar named It’s the End of the World, Baby after the popular belief that the world will end on the 21st of December 2012. Now, my personal opinion on that date is that it’s a load of rabbitpoop – you may quote me on the 22nd December – but if that gets Milla into 13 haute-couture dresses and throw a party then I’ll keep quiet for now. And how can I ever say no to Milan… I accidentally discovered marocchino (a miniature cappuccino with a cube of chocolate dunk for the sweetest last swig) and that was simply the best cure-in-a-cup for my travel exhaustion. Thank you Campari for having me over, and Katy for the shots of moi! I know this is a bit of a silly question, but im just curious to know if you did that fruit plate or if your hotel gave it to you like that? Love the way you’ve itemised the outfit in the first picture, always in awe of your technical know how! Tempted to buy that H&M sweater in a brighter colour now, I have already been living in the green. Glad you had fun and hope Milan gets it act together soon! I would love to go to Milan one day. That drink sounds incredible…I wonder if one of the many designer coffee spots in LA will have it on the menu…must explore. Glad you had such a wonderful time in Milan, and found a beverage gem. Loving the shoe galore. Beautiful photographs, as always – and the marocchino looks delicious, I’ll have to try that next time! Is that a MUJI ballpoint pen – mechanical pencil combo? Ah, I really love that pen. i have never been to milan but would make space to go any day. looks like an incredible place. your photos are so clean cut and beautiful. omona.. love the sudden pop up in your picture. always technique.. technique! I quite admire your photography and photo editing skills. Everything always looks so lovely, and your posts are always a joy to look at. Wow, who makes that brown leather bag ? It’s just divine! Your pics are fantastys. I love this blog..
Wow, that McDonald is so different from those commonly seen. the milan trip looks awesome- i must go soon! p.s those topshop shoes look fab! 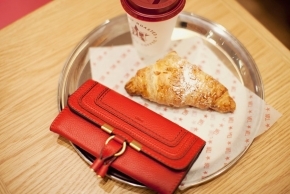 I specially focus on the H&M deep red jacket in the first picture, the Bimba & lola bag and of course, the happy breakfast! ohh i love that orange sweater of yours! it’s funny seeing McDonalds within all that old-school, glamorous architecture! I just cant stop starring at the black dress you wore in the first picture. Turns out the dress is from Indonesian brand, and I’m Indonesian myself.. Hehehe.. It does looks nice on you, Shini! And the silver shoes are gorgeous. the photos are so beautiful and inspiring! your argumentation as to why the world’s not ending on that day is just brilliant. I lol’d a little (in my mouth)! Haha, Campari is a drink you either like or dislike! Woahhhh loving your venure photoz. So rare to see you in jeans nowadays. After seeing your pictures I now feel that I´ve been a trip to Milan. Great. Thank You! Stunning pictures, Shini! My only Campari experience was when I offered to buy a friend at a drink and he asked for a Campari and grapefruit juice. It was £5.50!! And this wasn’t a special occasion, just a quick drink. I was too polite to say ‘buy it yourself, you cheeky sod’. It was tasty though. I started reading your blog about 4 months ago when I moved to Milan from the States. I really need fashion help. This is your second trip here since I’ve been here. I hope that by your third I have something decent to wear so I can then invite you for a thank-you caffe. Grazie Mille e a presto…. Milan is one of those cities that have their magic, but always look better in photos. Your photography amazes me every time. I’m agreeing wholeheartedly with your view of the 2012 crazyness. I’ve read a book about it, that was advocating this end of world thing just for kicks and giggles and gee what load of crap. Oh yes, the mayan calender ends there? Not true, they had longer lasting calenders and by the way has the author never thought about the fact that they had better things to do with life than to calculate calenders more then 1000 years ahead?!!! So the sun isn’t as active as “normally”? It’s 400 years of monitoring the sunspots vs. 5 Billion years of the sun, that’s a blink for the sun and there’s no reason to get all excited and calling for the end of the world. Total ballocks, if you ask me. I love when your coming back from the fashion week, because you will spoiled us, your reader with a lots of beautiful pictures. When i see those pictures i feel like i was there together with you enjoying the milan fashion week,lol. Amazing photos! I love the topshop cardie in the first photo. I lopve your blog so much. What a beautiful post, love the mood in these photos. PS. Is that the gorgeous Enigma Filofax I spot in the last photo? you allways have great little details on your blog and this “hover the picture and find out what I am wearing” is amazing! could you give me a tip on how to do that. i love it. I am rebuilding my blog, from scratch (G+ killed the old one) so i would like to implement that lovely little trick. Tout l’ esprit de Paris!